Crowdfunding Place – Below Market Value Property Investments in the UK. Welcome to Crowdfunding Place, where property investing is about real people. Our platform was created to accommodate beginning investors as well as the experienced ones. We’re a real estate online crowdfunding platform that uses people investment power to bring below market price property projects together. Crowdfunding Place allows you to invest and own property assets directly in a few simple steps online. Our market leading technology gives investors access to exclusive, discounted real estate investment opportunities. We are regulated by Financial Conduct Authority and provide our investors with a defined exit strategy. 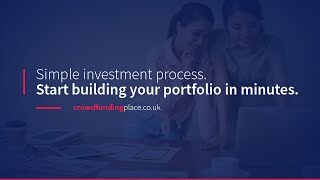 Join our platform by creating an account for investors on our website http://crowdfundingplace.co.uk and start investing today, from as much as £500! Follow us to be the first to know about new properties and to be up to date with our actions.